Dill is one of the easiest herbs to grow. The feathery leaves and yellow flowers are pretty in the garden and in floral arrangements. And dill is infinitely useful in the kitchen. You can buy dill plants at the garden center, but they're simple to start from seeds. Dill is an easy herb for beginning gardeners to grow. Plant dill during cool weather. In warm winter areas that don't experience a hard frost, you can plant dill in fall or winter. In cooler areas, plant dill in the spring, a week or two before the last hard frost. After the first sowing, you may want to plant again every two to three weeks for a continuous crop. Dill is grown as an annual. However, it often reseeds itself in the garden. Like most herbs, dill likes full sun, but will tolerate a little afternoon shade. It grows up to 3 feet tall, so plant it at the back of your flower, vegetable, or herb garden. Dill grows in most soils. Prepare your garden with plenty of organic matter such as compost. Start seeds directly in the garden. Sow them close together to allow plants to support each other as they grow. Cover seeds lightly, and they will germinate in a week or two. Dill requires little maintenance. The most important task is to keep the garden free of weeds. Plants have long tap roots so are quite drought resistant. A light feeding with an organic fertilizer in late spring should provide adequate fertilizer for the season. Pests or disease are seldom a problem. If caterpillars become a nuisance, you can usually control them by hand picking. Dill can also be grown in pots. Choose a deep container to accommodate the tall plants and their long roots. You should keep container-grown plants well watered and may need to stake them. Plants grown in containers also require more frequent feeding. Growing dill indoors is easy as long as you provide adequate light. A location that receives at least 5 to 6 hours of direct sunlight is best. Otherwise, provide 12 hours under fluorescent lights. Be sure your pots have good drainage. You'll probably need to stake dill grown indoors. Dill adds refreshing flavor to your recipes. Both the leaves and seeds are used in cooking. 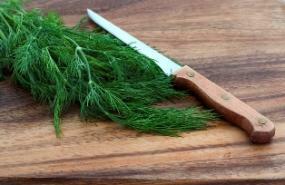 During the growing season, cut your dill to use fresh as you need it. For best flavor, cut the foliage just before the flower clusters open. This will also prevent the plant from going to seed right away. If you cut more than you can use, dry or freeze the leaves to use later. You can dry it by hanging it upside down in a well-ventilated area out of direct sunlight. Or try using the microwave. Spread dill stems in a single layer on a paper towel and microwave on high for 3 minutes. After removing, discard the hard stems, crumble the leaves, and store in an airtight container protected from light. 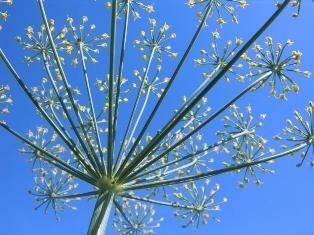 Once seed heads begin to form, it's time to stop cutting dill for fresh use. After the seed heads have developed and dried completely, you can harvest them. You'll be able to remove the seeds easily with your fingers. Freshly cut, chopped leaves boost the flavor of dips, herb butters, soups, salads, fish dishes, and salads. Use the seeds in pickling and to flavor roasts, stews and vegetables. Try grinding the seeds to use as a salt substitute. Both the flower heads and seeds are used in flavored vinegars and oils. Dill is known for its tranquilizing properties. To make a stomach-soothing tea, simmer a teaspoon of mashed seeds in a cup of boiling water. Steep for ten minutes. Dill is also used to ease colic in infants. Dill makes a lovely addition to flower gardens, where it adds soft texture and bright, chartreuse accents. The flowers are also striking and aromatic in cut floral arrangements.